Animation news -- and much more! Brandon Vietti is one of three directors of Superman Doomsday, handling the first act, but he told The Continuum it was a little like directing his own movie. "The first third of the movie is very self-contained," Vietti told The Continuum. "So, in this case, we're establishing all the characters, of course, and we're bringing the audience into this world, that I think is a little different than the Justice League show. With all the introductions and big action pieces, it's fairly self-contained." Lauren Montgomery directed the second act, with Bruce Timm handling the third. "It wasn't too difficult," Vietti said of splitting up the duties. "Of course, you have to keep an eye on what's coming in the second and third parts and there's some hooking up that needs to be done." Vietti worked on Superman Doomsday after four years as a director on Kids' WB! 's The Batman. He said he enjoyed the opportunity to work with Timm again. "Bruce brought me into the business for The New Adventures of Batman/Superman," Vietti said. "That was my first job in the industry. It was just great to come back and work with him again 10 years later." 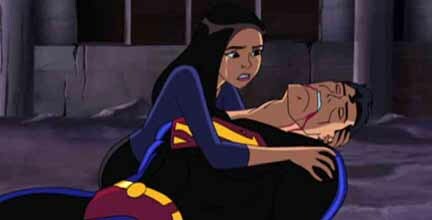 Vietti said he definitely remembered "The Death of Superman" story that the film is based upon. "Oh, yeah. I used to run to the comic shops when those were coming out, with everyone else," he said. "I bought my 20 copies and put them in the plastic bags. "The movie's got some parts that are faithful, but obviously there are some surprises to it, too. But I think through the script, fans are goods in hands." 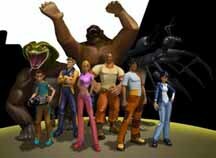 Vietti, whose credits also include MTV's Spider-Man series, is now working on Legion of Super Heroes. Look for comments from him on that show soon here in The Continuum. Superman Doomsday will be in stores on Sept. 18. Look for more on the film soon here in The Continuum. Many of the screen menus for the Heroes: Season 1 DVD will feature the artwork of Tim Sale. The seven-disc set, due in stores on Tuesday, features all the episodes of the NBC series. Special features include five featurettes, more than 50 deleted scenes and the 73-minute pilot cut by series creator Tim Kring. Sale, whose art is used in the show, is profiled in one of the featurettes. Click on the thumbnails for larger images and look for more on Heroes soon here in The Continuum. Bluewater Productions has provided The Continuum its solicitations for December. Heroic Publishing has provided The Continuum its solicitations for December. Titles include Wasteland #11 from Oni Press; Conan #43, Hellboy: Darkness Calls #5, Buffy the Vampire Slayer #6, The Groo 25th Anniversary Special and Lobster Johnson: The Iron Prometheus #1 from Dark Horse Comics; and Parade (With Fireworks) #1 and Madame Mirage #2 from Image Comics. Animation veteran Shaun McLaughlin, whose credits include Batman Beyond and Cartoon Network's two Justice League series, is producing the animated movie Gene-Fusion: Tournament of Champions. Based on the Beckett Entertainment property created by Jeff Amano, the film is a co-production of Beckett and Pop6 and is targeted for a 2008 release. "We were originally thinking of it as TV/DVD, but was we've moved along, we're impressed ourselves -- and the crew has impressed us -- to the point that we're gong to look at other options for release," McLaughlin told The Continuum. The film, set in 2310, deals with a sport called Gene-Fusion, where specially trained athletes called "Fusers" design their owned super-creature by combining three forms of animal DNA. The movie is written by Gabriel Benson and directed by Francois Brisson. "This is the most fun I've had in recent memory and I can't wait until people can see all of what we've done," McLaughlin said. According to producer Greg Weisman, Kids' WB! 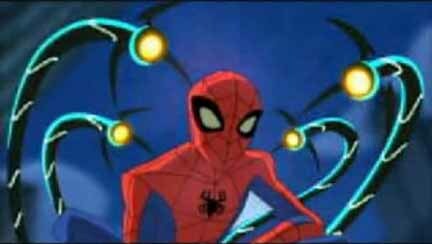 's upcoming The Spectacular Spider-Man animated series will be formatted to accommodate both television and DVD. The series will be set up in arcs, much like comics stories are geared for trade paperbacks. "We're doing 13 individual episodes to stand alone to air on the Kids' WB!" Wesiman said. 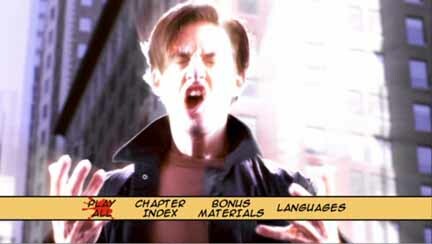 "But every three or four episodes also has to work as a DVD, because they're going to be released on DVD by Sony. "So we wanted as much as possible for those to play like a movie. It won't be the same as if it was written just as one piece as in a movie, but as much as possible, we wanted each unit of three or four episodes to have cohesion to them. And then we wanted the whole season to have cohesion. "So there's a lot of subtle, not hard to get, but intricate plotting to it." The villains in the first arc will include Vulture, Hammerhead, The Enforcers (Ox, Fancy Dan and Montana) and Electro. Other first-season villains will include Doctor Octopus, Sandman, Green Goblin and Venom, and the show's creators have hinted at the formation of the Sinister Six. * Jamie Thomason is the show's voice director. Thomason's credits include last spring's TMNT and numerous Disney shows since 1991. The show is being recorded in California. * Weisman himself wrote the first episode. * Anna Watson will appear in the show. * The animated trailer that was shown at Comic-Con International and is now online contains actual dialogue from the series. * Look for much more on Spider-Man here in The Continuum. Marvel Comics has declared October a Zombie Month, releasing images and plans. Topping the month is Marvel Zombies 2 #1, due in stores on Oct. 17. Writer Robert Kirkman, artist Sean Phillips and cover artist Arthur Suydam reunite for the sequel. In the series, after eating everything -- and everyone -- in the universe, the Zombies return home to Earth, hoping to devour the remaining humans, but are confronted with something that will cause them to take sides against each other. * Marvel Spotlight: Marvel Zombies, due in stores on Oct. 24. * The Marvel Zombies Dead Days Poster, featuring Suydam's new version of the cover to X-Men #1, due in stores on Oct. 3. * Marvel Zombies: The Covers HC, bringing together artists from Greg Land to Phillips to Suydam, and showcasing their zombie art, with a new cover by Suydam, due in stores on Oct. 24. 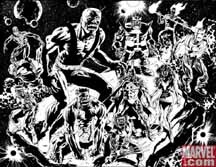 * Marvel Zombies/Army Of Darkness HC, collecting the sold-out Marvel/Dynamite limited series, due in stores on Sept. 12. * The fifth printing of Marvel Zombies HC, featuring a new Mary Jane cover by Suydam. Marvel also announced there will be variant covers that won't be seen before their release in print. * Fantastic Four: Rise of the Silver Surfer's Jessica Alba was named Choice Hottie -- Female at Fox's Teen Choice Awards on Sunday night. Transformers' Shia LaBeouf was honored as Male Breakout Star. * 20th Century Fox has announced that Aliens vs. Predator -- Requiem is the title of the film due in theaters on Dec. 25. * Fox Home Entertainment is releasing Family Guy Freakin' Party Pack on DVD on Oct. 30. The Party Pack features more than 9090 episodes from the Family Guy Volume 1-5 collections with hours of bonus material on 18 discs, including the straight-to-DVD feature Stewie Griffin: The Untold Story and a bonus material disc with deleted scenes, interviews and featurettes not currently available on any other DVD. It also includes a Family Guy themed ping-pong set including paddles, a net and balls and 100 themed poker chips with two sets of playing cards, all in a collectible carrying case. * Marvel Comics has announced a second printing for Halo: Uprising #1. Featuring a sketch variant of the Alex Maleev cover the second printing will be in stores on Sept. 26. * The Simpsons Movie placed seventh at the box office over the weekend with an estimated $4.4 million, pushing its total to $173.4 million. Stardust placed eighth with an estimated $3.9 million, pushing its total to $26.4 million.